We have all learned to recognize the recycling chasing arrows on packaging and items that we use, which serve as a reminder that we should recycle. In addition to the chasing recycling arrows, we all noticed that in the case of plastic bottles, lids and many other plastic products inside the arrows there is a number which most of us don’t really know what it stands for! As a matter of fact most of us don’t even know where the numbering stops! Below you can find a list that explains what each identification number code stands for and finally have some clarity on what type of plastic each number represents. In addition you will find out which type of plastic can be reused. HDPE (High Density Polyethylene) is usually used for: shampoo bottles, milk containers and grocery bags. It is considered safe to be reused. PVC (Polyvinyl Chloride) usually used for: food packaging, oil bottles and pet’s toys. It is not reusable. LDPE (Low Density Polyethylene) usually used for: squeezable bottles (i.e. ketchup) and frozen food bags. It is considered safe to reuse it. PP (Polypropylene) usually used for: diapers, kitchenware, disposable plates and cups and it is considered reusable. PS (Polystyrene) usually used for: cutlery, egg cartons and take away disposable containers. It is better to avoid using it in general as it might leach into food products. Other plastics. Usually it in these category can be found CD’s, eyeglasses and sunglasses, soda bottles thus since there is a variety of plastic types under this category it is better not to reuse items that are disposable. In general, products in this category are usually not recyclable. Overall 2, 4 and 5 can be reused whereas for the rest it is better not to. Note that plastic recycling level because of its many categories is relatively low (it is estimated at around 6%) since the various types of plastic make sorting quite hard which consequently translates to a high cost. Moreover, confusion among consumer about what numbers stand for make it even more difficult i.e. number 7 plastics that are not suitable for recycling quite often find their way to recycling plants. Hopefully in the future technology will enable better sorting techniques thus increasing recycling levels. 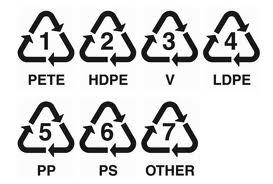 In the meantime what can be done today is reducing consumer confusion about the numbering through education of the local communities since the ability of recycling plastic varies from area to area.